It is still National Poetry Month in America and Canada (the UK celebrates in October) - and I thought you peeps would enjoy the wonderful Alvin Pang poem The Business of Writing which begins with the totally true line 'Writing as an enterprise is fraught with hazard'. 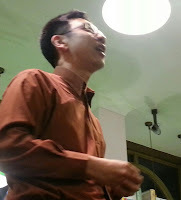 I met Alvin when I recently attended a presentation highlighting Singaporean books at Daunt Books in Chelsea to hang out with SCBWI Singapore friends. I came away with a very plain blue book published by the Croatian publisher Nakladnik, a translation of Singaporean poet Alvin Pang's Other Things and Other Poems (Druge stvari i ostale pjesme). The Business of Writing appeared in the collection. This is exactly how I feel right now. Like I'm facing the dense smoke of a thousand plausibilities, at the same time wondering if I really had it in me to make it happen. I get that dense smoke every time I sit down to write and it takes a huge effort to stop rubbing my eyes and get on with laying words on the page. stinging less lightly than before. Alvin likens the business of writing to 'your first ... and any other night on the stage'. It sure is. The Business of Writing by Alving Pang ... (discovered in Other Things and Other Poems published by Nakladnik) -- go to this page to read the whole lovely thing. Exquisite. Thanks for sharing this, Candy. I'm blinking in that same smoke. Thanks, Amy. Some days, visibility is very low. Yes, thank you Candy. That is wonderful - I'm off to read the whole poem now and then print it for my wall! It's a wonderful poem. Wonderful to discover a new poet. You are correct, it is not an simple obsession to quit the habit of smoking specially when you are a chain smokerStop Smoking in Brisbane-Lifetime Guarantee!.